If you're looking for a great beach on the North Shore of Long Island, New York, then North Hempstead Beach Park, a.k.a. Bar Beach, is a good choice. With 34 sprawling acres of sandy shores that are typical of the island's northern areas, the beach faces Hempstead Harbor, a quiet bay in Nassau County. You might also be interested in Long Island Beaches for a photo tour of some other sprawling sands in Nassau and Suffolk Counties. Stroll on the sand, enjoy the water during the summertime, or amble across the promenade as you view the waterfront. The 60-acre park is adjacent to the beachfront property and offers a variety of courts for games including handball, basketball, and paddleball. There are also shuffleboard courts and areas for playing horseshoes. You can jog around the course, and there are picnic areas where you can relax and have a meal or even barbecue your food, and a playground for the kids. There is also a boat ramp, a bathhouse, a fishing pier and much more for visitors. During the summer, there are free concerts here and in other Town of North Hempstead parks. North Hempstead Beach Park is located at 175 West Shore Road, Port Washington, New York. (Note: if you are using your GPS to find the beach park, please enter "175 West Shore Road, ROSLYN, New York" to get directions.) For more information, please call (516) 869-6311, or call Nassau County's general number at 311. Directions to the beach and park: If you're coming from Northern Boulevard, turn at North Willis Avenue. Then make a left onto Old Northern Boulevard. Then turn onto West Shore Road, where you will see the entrance to the park. If you are driving on the Northern State Parkway, get off at exit 29 North (Roslyn Road.) Then continue on Roslyn Road until you reach the very end. You'll see Roslyn's famous clock tower on your right. At the traffic light, please bear left to West Shore Road, and continue for about three miles. The beach and park will be on your right. If you're taking the Long Island Expressway (L.I.E. ), get off at exit 37, going towards Willis Avenue/Mineola/Roslyn. Then merge onto Powerhouse Road/South Service Road. Make a left onto Mineola Avenue/Willis Avenue and continue down Mineola Avenue. Make a slight right onto Wallbridge Lane and then turn onto Old Northern Boulevard. Then turn onto West Shore Road. 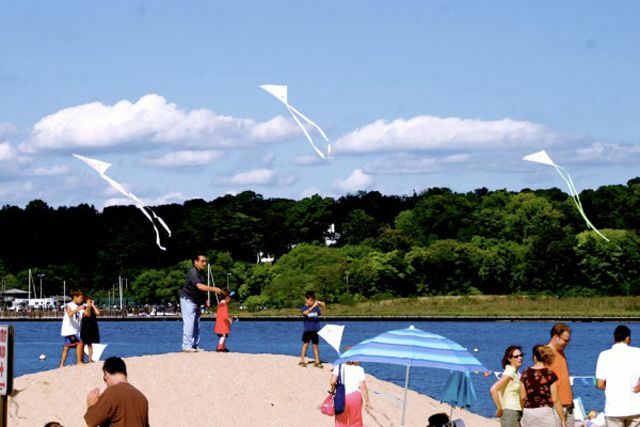 While you're visiting the beach and park, you might also want to visit the nearby Sandminers Monument Park, which tells the fascinating story of how millions of tons of Long Island sand were dug up and transported to Manhattan to be mixed into concrete for the construction of skyscrapers and more. There is FREE admission to the monument park.